Oh, Deer! What Happens If You Hit Wildlife While Driving? > Oh, Deer! What Happens If You Hit Wildlife While Driving? 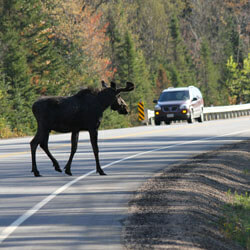 Would you know what to do if you hit a deer, moose or other wild animal—big or small? Road kill is a grisly, but common sight especially at this time of year. So if you hit a deer, do you know whether or not you would be covered for this type of collision? If you've had the harrowing experience of hitting a large animal, like a deer, moose, bear or elk, then you know that the collision can cause considerable damage to your car. Are you covered? Probably, yes, if you purchased collision coverage and comprehensive coverage when you bought your car insurance. Not everyone does, because these coverages are optional. Collision coverage provides coverage if your car is damaged in an accident, while comprehensive provides coverage for non-accident related claims: both have a deductible. Collision or comp? Which one applies when you hit a deer (or other animal) and there's damage? That depends. Was the animal moving and alive when you hit it, or was it already dead on the road (killed by another driver)? If the animal was alive—and suddenly appeared—then typically your comprehensive coverage would apply. If the animal was dead from a previous collision, then your collision coverage would usually apply. Why the difference? In the latter scenario, the animal is already dead and laying on the roadway, so there's an expectation that you should have seen it in time to make a reasonable—and safe—effort to avoid the collision. Did you know? There are two peak seasons when collisions with a deer or moose are more likely to occur. Collisions are more likely to happen in the fall (October and November) during mating season and then again in the spring after they've given birth to their young and are actively foraging for food. 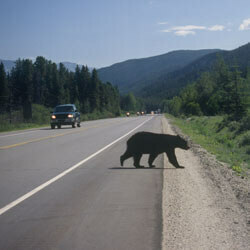 It's been said that every hour in Canada, there are between four and eight car accidents that involve large animals. It's more common than you may think, which is why the Traffic Injury Research Foundation created the Wildlife Roadsharing Resource Centre (WRRC), including tips on how to avoid a collision with wildlife and what to do if a collision is unavoidable. Be alert and prepared to react, especially if driving near dawn or dusk. Watch your speed and be careful when driving at night as visibility is diminished. Slowing down will give you more time to respond. Scan your surroundings constantly. If you're driving with passengers, ask them to watch for animals too. The more eyes, the better. If you see one, assume there are others in the vicinity as many animals travel in groups. If you see animals on the road, stay calm, take your foot off the gas and gently brake. Put your hazards on to alert drivers behind you that there's something up ahead. Use your car horn with caution. According to the WRRC, honking the horn could startle the animal to run across the road (into unsuspecting traffic) or to flee/charge at you instead of away. In general, resist the urge to swerve as this can result in a more serious accident. You could lose control of your vehicle, hit other vehicles, or others road users. Instead, drive straight and maintain control of your vehicle. If it's a large animal, try to avoid a head-on collision to lessen the impact. Aim to graze the animal, if possible, at its flanks. Take your foot off the gas, brake carefully, and keep a firm grip of the steering wheel. Pull over to a safe location and turn on your hazard lights. If you must leave your vehicle, stay off the road and out of the way of any oncoming vehicles. 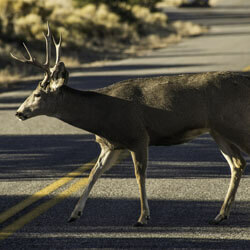 Call the local police if the animal is injured, blocking traffic or is creating a hazard for other drivers. Also, do not approach the animal, especially if wounded. Inspect your vehicle and document any damages. If there's damage, give local police a call, and don't forget about your car insurance company. Both will be able to help you with roadside advice and provide next steps. Finally, even if the damage seems minimal, make sure your car is drivable before leaving. Look for leaking fluid, broken lights or other damages that could result in an unsafe drive. If your vehicle seems unsafe in any way, call for a tow.